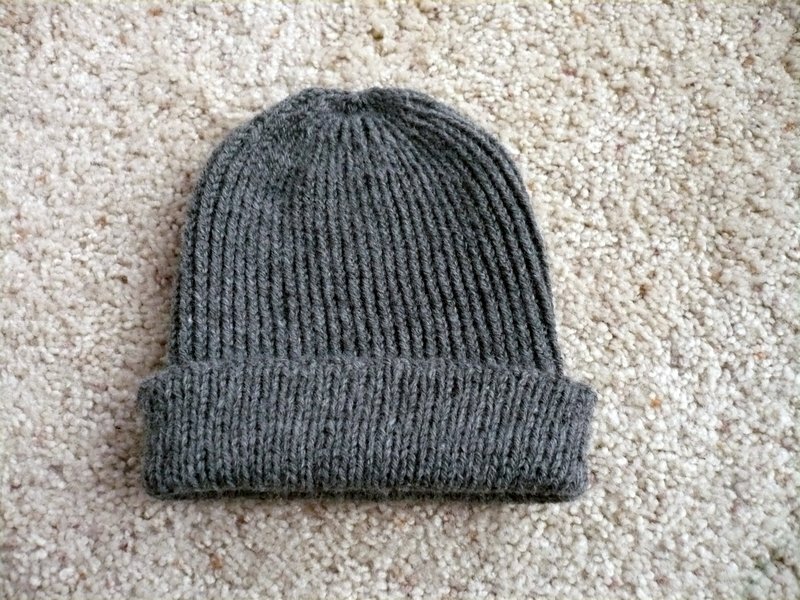 Certainly not the most thrilling or dynamic photo ever taken of a knitted object, but here's Peter's hat. I hope it fits, I hope he likes it, and I hope it keeps him warm when it's snowing. I used a wool/acrylic blend, making it toasty but still machine washable, and it's very stretchy so it can be pulled down to cover the ears if it gets very very cold. And I think it matches the pair of convertible gloves I knit for him two (Two? Really? Yikes!) years ago. I used this pattern, and cast on 116 stitches. It was knitted to 9" before starting the decreases, and the twisted rib (knitting into the back of the stitch instead of the front) kept it interesting. If you think it's too plain, don't look at me, talk to my husband. I'd wanted to knit one of these but my husband scoffed and said "No." Quite quickly, and quite vehemently (no offense to Jared, of course, it just wasn't my husband's thing - and he was guessing probably not Peter's, either). So there you go. The last Christmas gift, or, if you want to look at it in a different way, my first finished object of 2008. It's a great hat! I like doing the twisted rib stitch for hats. And I really like that Koolhaas hat. It's on my mental list of things to knit this year. It's a great hat Michelle. My husband would love a hat like that. He likes gray too (and blue-gray, gray-green, brown) they're all the same to me. Sometime I am going to sit down a figure out knitting! Thanks for that - it's a lovely hat. My husband has asked me to knit a hat for him but he rejects anything even faintly "out there" - I hope this one will appeal to him - how could it not? It looks like it will be very stretchy too. 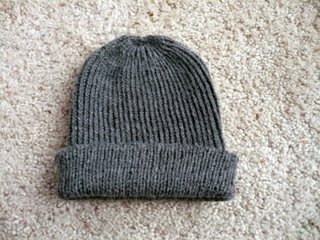 I made a very similar hat for my fiance for christmas. That koolhaas hat is GORGEOUS! I'm off to track that issue down, they're unfortunately sold out online.